If I give my kids the choice between a slice of cake and a cookie, they will choose a cookie every time. But if the choice is between a cupcake and a cookie, that is an entirely different story. There is something so appealing about having your own little cake that you do not have to share. In my home, this moist, vanilla flavored Yellow Cupcake is the most popular. It is delicious and they look lovely covered with a chocolate fudge frosting sprinkled with lots of shaved chocolate or colored sprinkles. Now, while you don't have to line your muffin pan with paper bake cups, who doesn't like to peel back the paper to see what surprise lies beneath. And, for the baker, they make the cupcakes easy to release from the pan and clean up a breeze. When I found this Yellow Cupcake recipe in Baking Illustrated by the Editors of Cook's Illustrated Magazine, I immediately knew it was a keeper. This cake batter is unusual in that you simply 'dump' all the dry ingredients into your mixer, then all the wet ingredients (all at room temperature), and beat them together. That is it. 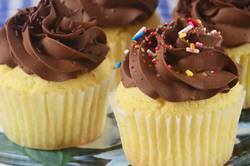 The result is a dense and moist yellow cupcake that is perfect especially when frosted. There are many types of frosting you could use to ice these cupcakes. Confectioners Frosting would be nice, but I especially like this rich and creamy chocolate fudge frosting which pairs so nicely with the vanilla flavored butter cake. This chocolate fudge frosting recipe is adapted from the excellent cookbook Chocolate Bar by Matt Lewis and Alison Nelson who run a chocolate boutique in New York that they call a "candy store for grown-ups". It is the type of chocolate frosting my mother always used to cover cakes. Made with butter, confectioners (icing or powdered) sugar, vanilla extract and unsweetened chocolate, it is perfect for covering cupcakes. It uses unsweetened chocolate which is also known as baking, plain or bitter chocolate. This is chocolate in its rawest form. Chocolate liquor that has been refined and contains 50-55% cocoa butter. Since no sugar has been added to the chocolate it has a strong, bitter taste that is used in cooking and baking but is never eaten out of hand. When used in this frosting it imparts a deep chocolate flavor. Yellow Cupcakes: Preheat oven to 350 degrees F (177 degrees C) and lightly butter or line 12 muffin cups with paper liners. In the bowl of your electric mixer, or with a hand mixer, beat to combine the flour, sugar, baking powder, and salt. Add the butter, egg, egg yolks, vanilla extract, and sour cream. Beat the wet and dry ingredients together at medium speed until the batter is smooth and satiny, about 30 seconds. Scrape down the sides of the bowl. If necessary, stir the batter with a rubber spatula until the flour is fully incorporated. Evenly fill the muffin cups with the batter and bake for about 20 - 25 minutes or until pale gold and a toothpick inserted into a cupcake comes out clean. Remove from oven and place on a wire rack to cool. Once the cupcakes have completely cooled, frost with icing. You can either spread the frosting on the cupcakes with a small spatula or, if piping, use a large Wilton 1M open or closed star tip to make lovely swirls. These cupcakes are best the day they are made, although they will keep for a few days at room temperature.